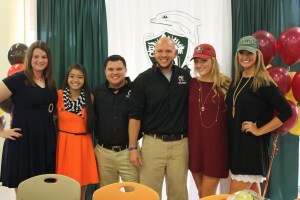 Tuesday, November 17, 2015 was a very big day for 5 Mosley students as they signed scholarships with the colleges of their choice. First Choice Physical Therapy and MVP Sports Enhancement are so proud of their achievements. It was so impressive how each athlete thanked God and their parents for their success. They also thanked First Choice and MVP for helping them achieve their college dreams. We would love the opportunity to help others achieve their college dreams. Call MVP Sports Enhancement to help take you to the next level 850-248-1600 a service of First Choice Physical Therapy.